The Port Authority Youth Value Fleece Vest Style Y219 is available in Youth Sizes: XS(4) S(6-8) M(10-12) L(14-16) XL(18-20) and can be purchased in your choice of the following colors: Black, Iron Grey and True Navy. Great mid weight fleece vest that is soft and warm. 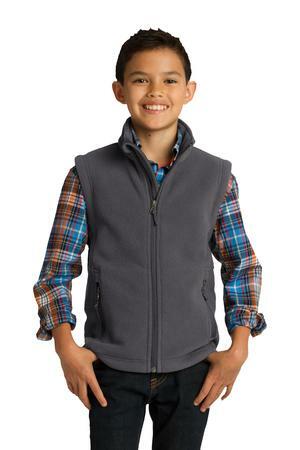 The Port Authority Youth Value Fleece Vest Style Y219 is available in Youth Sizes: XS(4) S(6-8) M(10-12) L(14-16) XL(18-20) and comes the following colors: Black, Iron Grey and True Navy. Bulk orders of 20 or more of the same product may qualify for discounts.219If you would like to personalize this product please contact us for services and pricing. Be the first to review “Port Authority Youth Value Fleece Vest Style Y219” Click here to cancel reply.